On April 10, 1966 Córas Iompair Éireann (CIÉ), the body responsible for the running of the Republic of Ireland’s railways since 1945, commemorated the 50th anniversary of the famous 1916 Easter Rising by renaming 15 of its stations after the principal players of that keystone event. As Ireland marks the 100th anniversary of the Rising, Gary Boyd-Hope takes a look at the stations in question. APRIL 24, 1916 is arguably the single most significant date in the history of modern Ireland. For it was early that morning that about 1,200 members of the Irish Volunteers (a military unit with links to the Irish Republican Brotherhood) and the Irish Citizen Army (effectively militant trade unionists) took control of strategic locations in the centre of Dublin and declared their nation free of British rule. It was the start of six days of violence and bloodshed that would ultimately go on to shape the future of all Ireland – it became known as the Easter Rising. 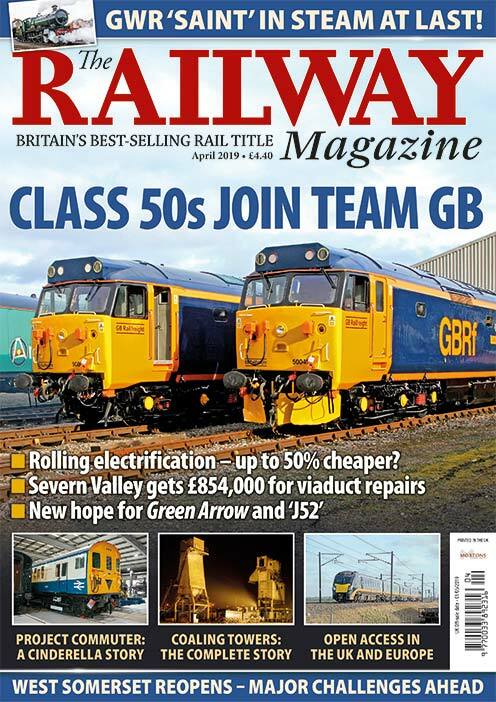 The Railway Magazine is not the place for a lesson in Irish politics, but for the sake of what follows, a brief account of that week would be prudent at this juncture. Resistance to British rule was nothing new to the Emerald Isle at the time of the Easter Rising, having been a dominant theme in politics since the 1801 Act of Union. Opposition had raised its head on numerous occasions, but the introduction in 1912 of the Third Home Rule Bill by the British Prime Minister Herbert Asquith, and the growing religious/political unease in parts of Ulster, was certainly a catalyst for what became known as the Home Rule Crisis. A general election in 1910 had resulted in overwhelming national support for Irish independence, though a localised majority in what now approximates to Northern Ireland favoured retention of Ireland within the United Kingdom. was agreed, albeit not unanimously, that April 23, 1916 – Easter Sunday – would be the date of the rebellion; the focus being on Dublin. A supply of arms had been sent over from Germany to assist in the uprising, but the ship carrying it was intercepted by the Royal Navy and scuttled, leading some of the figures of rank to try and call off the plan. Their actions only provided one day’s grace, and the fighting began on Easter Monday – April 24. Under the military command of James Connolly, the joint IV and ICA forces seized key strategic points on both sides of the River Liffey. The headquarters was in the General Post Office building on Sackville Street (now O’Connell Street), where Patrick Pearse read out his famous Proclamation of the Irish Republic, while other forces held the Four Courts, the Jacob’s Biscuit Factory, Boland’s Mill, the South Dublin Union hospital complex, Dublin City Hall, and St Stephen’s Green, among others, while an attempt was made to take Dublin Castle, which was the centre of British rule in Ireland at that time. unco-ordinated that first day. However, as both Amiens Street and Kingsbridge stations had not been taken by the rebel forces, the British were able to bring troops in from elsewhere as the siege extended into the week. By Saturday, April 29 Patrick Pearse, who had taken command from an injured Connolly, realised that his forces could not continue without further civilian losses and agreed to an unconditional surrender. Pockets of resistance continued as word began to filter through of the laying down of arms, the full surrender finally being made on the Sunday. The Rising was not confined to Dublin alone, with much smaller skirmishes taking place in Enniscorthy, County Wexford; Ashbourne, County Meath, and other locations in County Galway. Over the course of the Rising 64 volunteers lost their lives, with the British losses being 132. In comparison, 254 civilians were killed, with the number of wounded coming in at well over 2,000. British reaction was swift. Initially, gunships were despatched up the River Liffey to bomb the city, and 3,430 men and 79 women were arrested in the immediate aftermath. Most of these were later released, but on May 2 a series of court martials began that would see the leaders of the Rising tried for treason and sentenced to death. A total of 14 faced the firing squad at Dublin’s Kilmainham Gaol from May 3 to May 12, including the seven signatories of the Proclamation of the Republic, a 15th was hanged in London, and a 16th was put to death in Cork. While not directly having the outcome the rebels desired, the Easter Rising was a turning point for Irish politics. Its legacy furthered the desire for an independent Ireland, ultimately leading to the Irish War of Independence and the division of Ireland into the two separate entities it is today. In the north-east, six of Ulster’s nine counties became Northern Ireland; these were the areas with a Unionist majority, while the rest of the country became the Irish Free State, later renamed the Republic of Ireland. To many the protagonists of the Easter Rising are considered heroes and martyrs, and to others they were nothing more than terrorists. Yet whether you applaud or abhor their actions, their legacy lives on in more ways than one. In 1966 a series of commemorations took place to mark the 50th anniversary of the Rising. For its part, Córas Iompair Éireann elected to name 15 of its stations from across the network after the 16 individuals executed, thereby providing a lasting memorial to the Republic’s battle for independence. It was, one supposes, the equivalent of British Railways naming key stations after the influential figures of the Second World War. Trains on the Western Region might therefore arrive into London Churchill, East Coast services might call at York Montgomery before arriving in Edinburgh Harris, and holiday makers call into Exeter Brooke. Today the names of Connolly, Heuston and Pearse are well-known to most rail users in Ireland and further afield. Even Cork Kent is in regular parlance, although the others are probably only ever referred to by their full titles in the Iarnród Éireann-Irish Rail timetables. So which ones are they? With its Italiante façade and imposing central tower, Dublin Connolly is one of the best-known of all stations in Ireland. It was built as a terminus by the Dublin & Drogheda Railway, opened in November 1844, and was then known simply as Dublin Station. Ten years later it was renamed Amiens Street after the road it stands on at around the same time that through services to Belfast began to operate. Upon the formation of the Great Northern Railway (Ireland) in 1876 Amiens Street became the company’s headquarters, and later the heart of operations across the GNR(I) network to Cavan, Monaghan, Fermanagh, Tyrone, Belfast and Derry/Londonderry, including being the start/end point for the famous ‘Enterprise’ service. An elevated loop line connecting the station to Westland Row station on the south side of the Liffey was opened in 1891 by the City of Dublin Junction Railway; it had its own adjoining station known as Amiens Street Junction. This was amalgamated into the rest of the station in the late 1950s, becoming today’s platforms 5, 6 and 7. Today the station is the single busiest in the country, being the starting point for all trains to Dundalk, Belfast, Sligo and Rosslare, as well as a key stop on the Dublin Area Rapid Transit (DART) electrified commuter operation. In the 1990s it underwent a major refurbishment, receiving a new entrance hall and a partial re-roofing, and in the early 2000s the approach was heavily modified to accommodate a station for the Luas tram system’s Red Line. 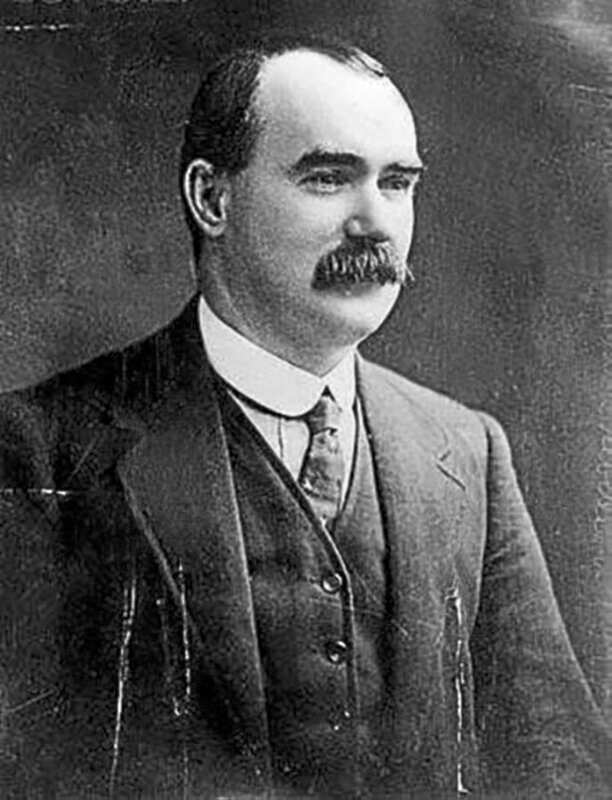 The name Connolly comes from James Connolly, one of the seven signatories of the Proclamation of the Republic. Born in Edinburgh on June 5, 1868 to Irish parents, Connolly was a staunch socialist and didn’t move to Dublin until the 1890s, and only then after accepting a job with the Dublin Socialist Club. He emigrated to the USA in 1903 but returned to Ireland seven years later, going on to form the Irish Citizen Army as a body to defend workers’ rights and protect them during times of strike. Connolly longed for an independent and socialist Ireland, and even threatened to take on the British with just ICA forces alone. However, he was persuaded to join his forces with those of the Irish Volunteers, and during the Easter Rising was given the role of commander-in-chief of the Dublin Brigade. He was one of the group that seized the General Post Office building on April 24, but during the occupation was badly wounded by a shot to the leg. May 12, 1916, having been tied to a chair due to his inability to stand. Anyone who has seen the film The First Great Train Robbery will be familiar with Dublin Heuston for it doubled as London Bridge station in this Victorian action romp starring Sean Connery and Donald Sutherland. 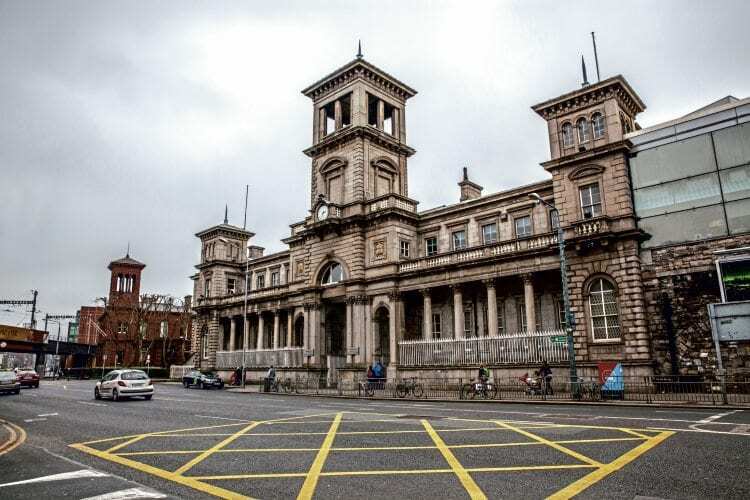 Opened by the Great Southern & Western Railway (GSWR) in August 1846, the new ornate terminus was designed by Sancton Wood and was known as Kingsbridge until 1966, taking its name from the adjacent King’s Bridge over the River Liffey. Throughout its life, Kingsbridge was the terminus for Ireland’s premier main line to Cork, with other lines to Athlone, Waterford, Tralee and connections to Limerick, as well as numerous branch lines. After the GWSR acquired the Waterford, Limerick & Western Railway in 1901, its influence expanded and Kingsbridge was chosen as the headquarters for the Great Southern Railways when that system was created in 1925 by the voluntary amalgamation of almost all railway companies whose lines lay solely within the new Irish Free State. When the GSR became part of CIÉ in 1945, and after CIÉ’s nationalisation in 1950, it became the group’s headquarters and remains so to this day. As such Kingsbridge was one of the most important stations in Ireland, and it was from here that locomotives such as the mighty ‘800’ class 4-6-0s, built just a stone’s throw away at Inchicore, would depart with expresses to Cork. Even today, the station still serves InterCity services to Cork, Limerick, Waterford, Galway, plus County Mayo and County Kerry, as well as commuter links to the likes of Kildare, Portarlington, Portlaoise, Ballybrophy, Limerick Junction and Mallow. The name bestowed on the station in 1966 comes from Seán Heuston, a member of the Irish Volunteers who was just 25 when executed on May 8, 1916. Heuston was a Dublin lad, born on February 21, 1891, and was employed by the GSWR as a clerk in Limerick. Here, he took an active role in Fianna Éireann (a nationalist boy scout organisation), later transferring back to Dublin in 1913, where he worked in the offices at Kingsbridge. Heuston’s role in the Easter Rising was comparatively short, as he was the commanding officer of a small group of volunteers who seized and occupied the Mendicity Institution in south Dublin on April 24. His orders, which came from James Connolly, were to hold the building for three or four hours in order to delay the advance of British troops, thereby giving those in the GPO building time to prepare their defences. Those few hours eventually lasted for more than two days, with the 26 volunteers fending off an assault by more than 400 British soldiers. 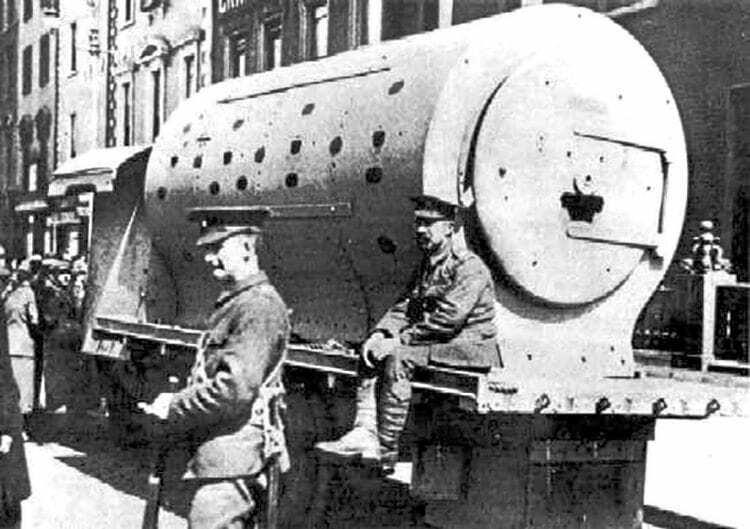 The barrage was incessant; Heuston’s men even resorting to hurling back grenades that had been thrown in by the British forces. However, outnumbered and almost out of supplies, Heuston surrendered and was taken along with his troops to the Royal Barracks, later being moved to Richmond Barracks, where he was tried on May 4. As an aside, due to the similar pronunciation to London’s well-known Euston station, Heuston is occasionally referred to as such by visitors, leading to bemusement among locals. Pearse holds several distinctions in the annals of Irish railway history. 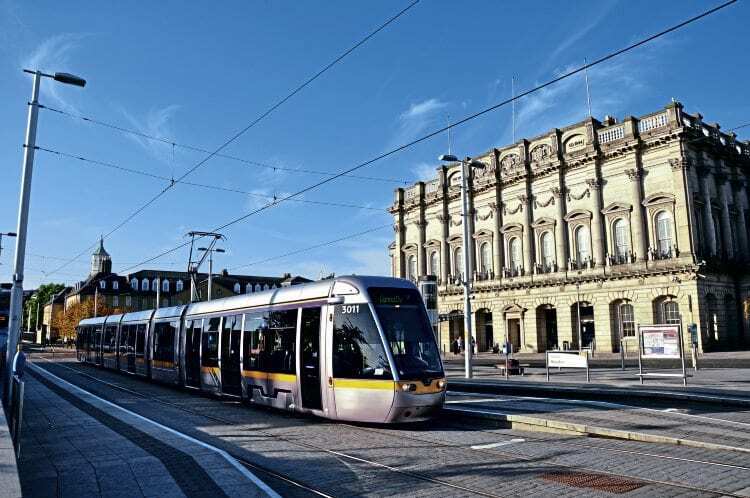 For one it is Ireland’s busiest commuter station, being located close to Dublin’s main commerce district and served by both DART and commuter trains. It is the terminus of some commuter operations to Maynooth and Longford, and also Balbriggan and Dundalk, which when combined with through services from Connolly to Arklow and Rosslare resulted in around eight million passengers journeys being made to/from the station in 2014. Formerly known as Westland Row prior to 1966, the station was originally built as the terminus for Ireland’s first railway – the 4ft 8½in-gauge Dublin & Kingstown – and opened on December 17, 1834 complete with overall roof by Richard Turner (of Liverpool Lime Street fame). Thus, it is Ireland’s first railway station, but is also – by two years – the world’s first commuter station. It was rebuilt with the coming of the City of Dublin Junction Railway in 1891 when it became a through station with a link to Amiens Street; it retained three bay platforms, although only part of one – platform 4 – now remains. Along with the GSWR’s Kingsbridge, Westland Row became part of the Dublin & South Eastern Railway prior to inclusion in the GSR merger of 1925, and for a time after the closure of the former Midland Great Western Railway’s station at Broadstone in 1937, it became the starting point for trains to Sligo, Westport and Galway, as well as those of the former DSER route south to Wicklow, Wexford and Rosslare. Today it serves none of these and functions purely as a commuter station on the DART system. Renamed in 1966, Pearse is today the headquarters of the DART and commuter operations. It underwent a major refurbishment in 2007/8 when the old bay platforms were removed, and in 2013 a new southern entrance serving nearby Pearse Street was opened. Incidentally, although the station is officially on Westland Row, its proximity to Pearse Street has resulted in it being referred to as Pearse Street station by many Dubliners. Another thing that set Pearse apart is that it was the only one of the 15 stations renamed to have been done so after more than one person. Brothers Patrick (born September 10, 1879) and William (Willie – born November 15, 1881) Pearse both grew up in Dublin, going on to become great exponents of the Irish language, with Patrick founding a school devoted to bi-lingual studies. As an advocate of ‘Home Rule’, Patrick joined the Irish Volunteers and the IRB in 1913, becoming one of the supreme councillors of the latter. His skills as an orator led him to become the chief spokesman for the Easter Rising, giving the order to mobilise to volunteers throughout Ireland. During the Rising it was Patrick who read out the Proclamation of the Irish Republic outside the GPO building – actually being mocked by some observers at the time – and later taking command from the injured James Connolly. It was Patrick who gave the order to surrender six days later. He was shot at Kilmainham Gaol on May 3, the first to be executed. As the younger brother, Willie had always lived in the shadow of Patrick, although he was a gifted sculptor with work still to be found in some Irish churches. He joined Patrick in his school venture and in banding with the volunteers, and even remained close to his side through the events of the Easter Rising. Like Patrick he was sentenced to death for his involvement and faced the firing squad on May 4. 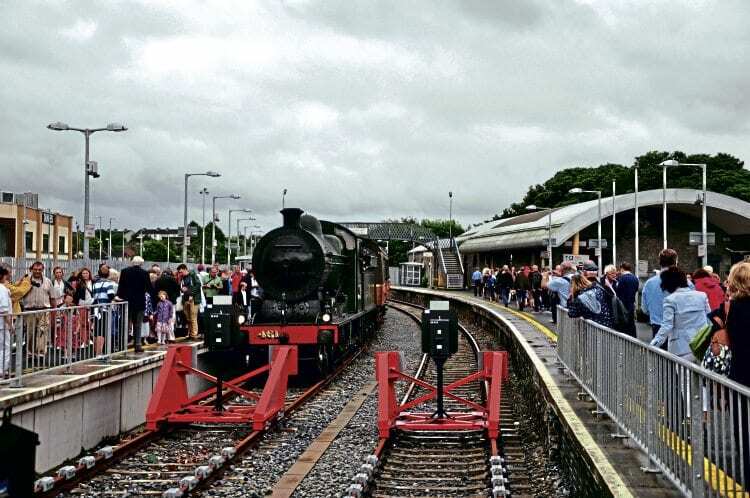 Tralee, in County Kerry, is best-remembered in railway circles for its 3ft-gauge railway to Dingle, although it was the Killarney Junction Railway (KJR) that first put the town on the railway map in 1859. Known simply as Tralee and later as Tralee South (the Limerick & Kerry station being to the north), the station is well-known in Ireland for the accident that occurred there on April 24, 1901 when a mail train failed to stop and smashed into the buffers, killing the crew. The KJR was operated by the GSWR, which later absorbed it, subsequently becoming part of the Great Southern Railways, CIÉ and Iarnród Éireann network. Today the station is served by seven or eight trains each day and retains its overall roof covering part of the main platform and the run-round loop (the platforms being extended in 1979). A shorter bay platform serves the south face of the main platform. The former container terminal and freight yard opposite the station remains in use by Iarnród Éireann-Irish Rail for use by permanent way trains and for the storage of redundant equipment. In 1966 it was named to honour Sir Roger Casement, a former British consul born on September 1, 1864 at Sandycove, Dublin. Casement was a humanitarian, famed for exposing human rights abuses by the colonials in the Congo as well as against Peruvian natives. He became involved in the Irish revolution in 1904, and was one of the founders of the Irish Volunteers in 1913 and the brains behind the doomed attempt to secure arms from Germany in order to carry out an uprising. 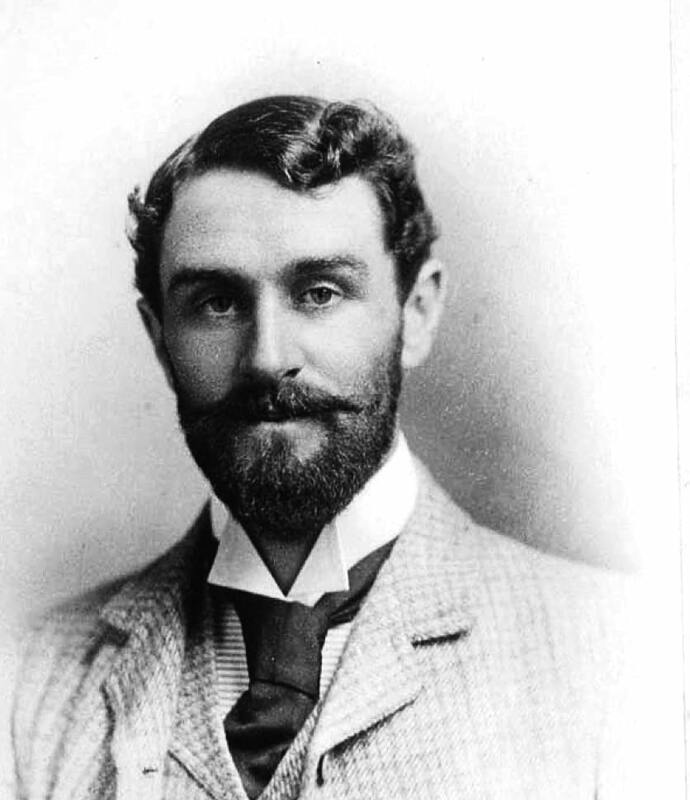 Prior to the Rising, Casement had been in Germany negotiating the arms, but upon learning that the supplies were inferior, he attempted to return to Ireland in order to call off the Rising. He was put ashore by a German U-boat on April 21, 1916 but was struck down by a recurring bout of malaria and was arrested in Rathoneen, County Kerry. He was imprisoned in the Tower of London, tried for treason, sabotage and espionage, and hanged at Pentonville Prison on August 3 that year. 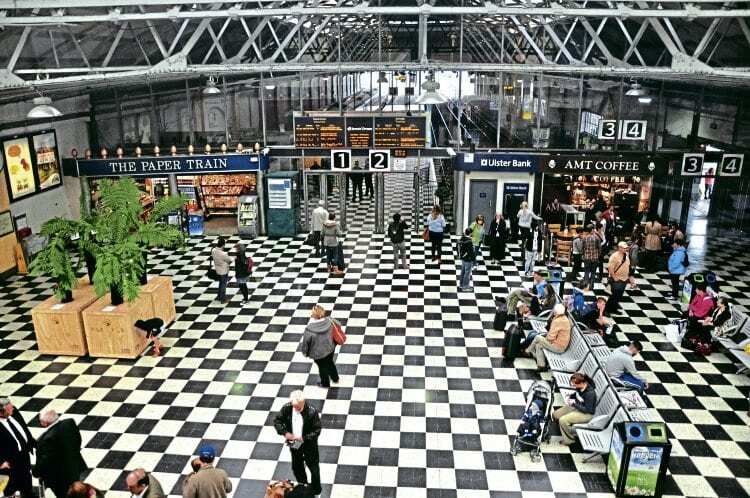 Dating back to 1851 when the Midland Great Western Railway opened its line from Mullingar to Galway, this station today comprises two platforms that serve InterCity services to Dublin Heuston and commuter trains to Limerick, Claremorris and Athenry. It was once the western terminus of the MGWR before the branch to Clifden opened in 1895, and with nearby Athenry later becoming an important junction from 1860, Galway found itself receiving and sending trains to/from destinations such as Ennis, Limerick, Sligo and Dublin’s Broadstone station. The closure of the Clifden branch in 1935, followed by the withdrawal of passenger services on the Sligo-Athenry-Ennis line in 1976, saw Galway’s status considerably reduced. However, this has been rectified in some part following the reopening of the Limerick to Athenry line; Galway received its first train from Limerick in more than three decades on March 30, 2010. On April 10, 1966 Galway’s station became Galway Ceannt in homage to Éamonn Ceannt, one of the signatories of the Proclamation of the Irish Republic. Born Edward Kent on September 21, 1881, in Ballymoe, County Galway, Ceannt grew up in County Louth where his father worked as a Royal Irish Constabulary officer. He was academically and musically gifted, and was welcomed into the Gaelic League (an organisation set up to promote Irish culture and language) in 1899, where he met fellow Rising leader Patrick Pearse. He became more determined to see Ireland gain its independence, joining the IRB in 1912. 4th Battalion of the Irish Volunteers. During the Rising he had 100 men in his charge, taking the South Dublin Union near Kilmainham, and not far from Kingsbridge station. His unit held ground throughout and saw intense fighting, but surrendered after the order was given by Patrick Pearse. However he was later accused of being part of a group that fired on British soldiers from Jacob’s biscuit factory on April 30, a charge he denied. His trial took place at Richmond Barracks on May 2 and he was shot at Kilmainham five days later. The Dublin & Belfast Junction Railway (D&BJR), one of the constituents of the GNR(I), reached Dundalk from Dublin in 1849, where a junction was made with the Dundalk & Enniskillen Railway. The new station was thus named Dundalk Junction; the D&BJR extended north towards Adavoyle and beyond the following year. The attractive station buildings were designed by Sir John McNeil, being situated on an island platform with a south-facing bay. Good use was made of polychromic brickwork, which combined with its ornate canopy made for what some still describe as the finest station in Ireland. The main ticket office lies above rail level on the east side of the station at the southern end, a covered walkway linking it with the island platform below. To the south of the station lay the works of the GNR(I), now but a memory. Dundalk today retains much of its character and is regularly served by the Dublin-Belfast ‘Enterprise’ as well as commuter services. It even retains one of its signal cabins on the platform and boasts a small museum in one of the station buildings here, displaying railway artefacts and photographs. Thomas ‘Tom’ Clarke, after whom the station was named on April 10, 1966, is generally credited with being the mastermind behind the Easter Rising. He was born at Hurst Castle in Hampshire on March 11, 1858 to Irish parents; his father being a sergeant in the British Army. The family eventually settled at Dungannon in County Tyrone, and by the age of 20 Clarke had joined the IRB. In 1883 he was arrested in London having travelled there to blow up London Bridge, subsequently spending 15 years in British prisons before emigrating to the USA upon his release. Clarke’s ties to Ireland remained – he even had a tobacconist shop in Dublin – and later paid close attention to the growing Irish Volunteers, helping to steer the organisation without actually being a part of it. Together with Seán Mac Diarmada, he effectively ran the IRB and in 1915 formed the military committee that would go on to plan the Easter Rising. During the conflict itself Clarke was based in the command centre in the GPO building, but was arrested upon the surrender by Patrick Pearse on April 29. He was tried on May 2 and executed the next day, aged 59. May 9, 1848 into a station about a quarter mile eastwards from today’s station. This itself was opened 10 years after the railway first reached the city on August 28, 1858, and became the headquarters of the W&LR (the company’s erstwhile works there still being used by Irish Rail to service wagons). After the W&LR acquired the extensions from Limerick to Tralee, and northwards to Collooney, it was briefly renamed the Waterford, Limerick & Western Railway before acquisition by the GWSR in 1901. Thus, the station became the centre of GWSR operations in the west and south-west of Ireland, and its most important station outside Dublin. Although several of the lines that once radiated from Limerick are long closed, the station remains the terminus of the Dublin to Limerick, Limerick-Nenagh-Ballybrophy and Limerick-Ennis-Galway lines. The re-opened route from Limerick to Athenry (and Galway) also starts here. In December 2014 planning permission was granted for a €16.8million redevelopment of the station area and its approaches. This includes the provision of a new car park and refurbishment of the station buildings. Work began last year. The name of Colbert was bestowed upon Limerick on April 10, 1966 after Cornelius ‘Con’ Colbert, a native of the county. His road to the Easter Rising likely began when he became a drill instructor at Patrick Pearse’s St Enda’s School and as a member of Fianna Éireann. Later he joined both the Irish Volunteers and the IRB. Having previously acted as Thomas Clarke’s bodyguard, during that 1916 Easter week Colbert fought at Watkin’s Brewery, the Jameson’s Distillery and on Marrowbone Lane, where he ultimately surrendered along with Éamonn Ceannt. It is said that when the order to surrender was issued, Colbert assumed command of his unit in order to save the life of his superior officer, who was a married man. He faced court martial at Richmond Barracks and was executed on May 8. William Dargan’s route from Dalkey to Bray opened on July 10, 1854, and in doing so created one of the finest railway journeys in all Ireland. It was part of the Dublin, Wicklow & Wexford Railway (DWWR), which had leased the Dublin & Kingstown route that same year, and progressively extended south through Greystones to Wicklow. The DWWR was later renamed as the DSER, under whose auspices it began a 42-year identity crisis. Simply known as Bray, in 1924 it was renamed into the Gaelic Brí Chualann (Bray), reverting to just Bray in around 1930, before gaining the addition of ‘Daly’ in 1966. Even today its bi-lingual station nameboards have the literal translation of Bré, instead of the correct Brí Chualann. 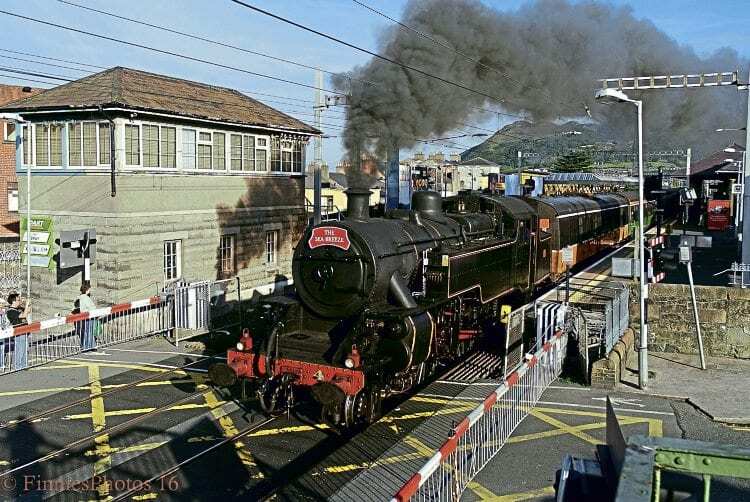 Originally having just the one platform, this was later joined by a bay at the southern end for Greystones traffic. However, with traffic coming from/to both Harcourt Street and Westland Row, the station was remodelled in 1928 to add an additional platform. In more recent times Bray served as the southern terminus of the DART electrified lines from 1984 to 2000. Bray is instantly recognisable to anyone arriving there today thanks to a series of mosaics on platform 2 that depict the story of Ireland and its railways. Edward ‘Ned’ Daly was the youngest of the Easter Rising leaders to be executed, being just 25 when he met his end on May 4, 1916. He had grown up in Limerick, later moving to Dublin, where he lived with his sister and brother-in-law – Thomas Clarke. A member of both the Irish Volunteers and the IRB, he reached the rank of captain with the volunteers and gained command of the 1st Battalion. During the Rising, Daly and his men were positioned in and around the Four Courts, seeing some of the most intense fighting of the week. His surrender came on April 29, although it is said that during his court martial at Richmond Barracks Daly claimed he was simply following orders. Cork Kent is certainly one of the most recognisable stations in Ireland; the view of northbound trains departing from the curving trainshed, as seen from the adjacent Glanmire Road bridge, gracing many a railway book. It is the only remaining station from a total of six that once served Cork, opening in February 1893. It was built by the GSWR to replace two earlier terminus stations, thereby allowing through running of GSWR trains from Kingsbridge onto former Cork & Youghal Railway metals. 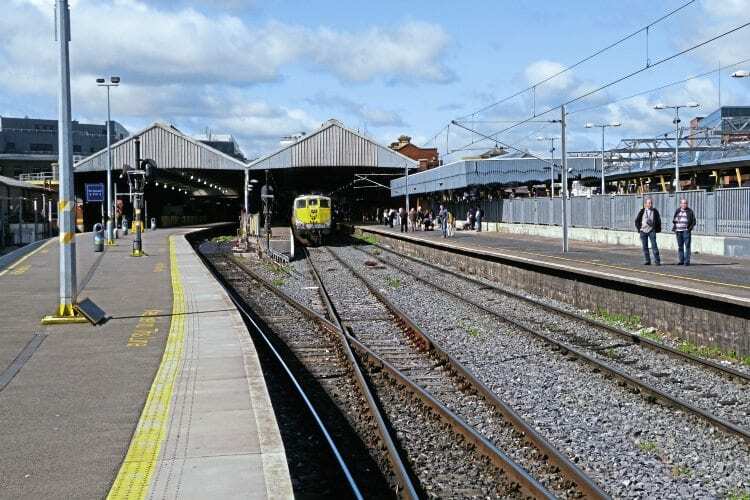 Although a through station, it retains three terminating platforms (1 to 3 for suburban traffic to Cobh and Midleton) plus two through platforms (4 and 5). At one time there was an extra terminus platform alongside platform 3 that was numbered 4 (the through platforms being 5 and 6 until the mid-1990s), although this was removed in 1984. The station today is served by direct InterCity trains to Dublin Heuston (worked by General Motors Class 201s) with other services to Tralee, Cobh, Mallow and Midleton. 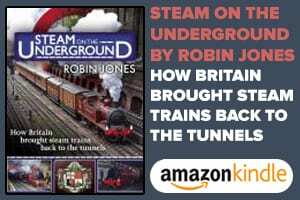 It is known for its role in The First Great Train Robbery when it doubled as Folkestone, as well as for being home to Ireland’s oldest steam locomotive – the 1847-built GSWR 2-2-2 No. 36, which is displayed on the concourse. The ‘Kent’ part of Cork Kent belonged to Thomas Kent (born August 29, 1865), one of a nationalist family from Castlelyons, County Cork, who actually took no part in Dublin’s Easter Rising. The Kents (Thomas and brothers David, Richard and William) had been ready to take part in the planned local uprisings, but when the mobilisation order was countermanded following a warning by Roger Casement, they stayed at home. The events in Dublin, however, resulted in the Royal Irish Constabulary seeking out known sympathisers and early on May 2, 1916, the Kent’s home was raided by a party of RIC officers, led by Head Constable William Rowe. The pitch battle that ensued lasted for four hours during which Rowe was killed and David Kent was severely wounded. Richard Kent, making a bid for freedom, was also seriously wounded, dying from his wounds two days later. Both Thomas and William were arrested and court martialed under the charge of armed rebellion. William was acquitted but Thomas found guilty of murdering Head Constable Rowe and sentenced to death. He was executed by firing squad on May 9, 1916 at Collins Detention Barracks, Cork. Since Galway station was also renamed after a man who coincidentally shared the same surname, the decision was taken to use the English language version in Cork, and the Irish language in Galway, where it is still prevalent in the western area of the county. The first Drogheda station opened on May 25, 1844 when the Dublin & Drogheda Railway (DDR) arrived on the south side of the River Boyne. Five years later the Dublin & Belfast Junction Railway reached the north side of the river, and on May 11, 1853 the first – albeit temporary – Boyne viaduct was opened to connect the two. A new passenger station was built about a quarter of a mile north-west of the DDR station, located on a sharp curve on the south approach to the 1855-built Boyne viaduct, which carried the railway 30metres above the waters below. The railway later joined the GNR(I) network, Drogheda becoming a principal destination on the Dublin to Belfast main line. At one stage there were three lines running through the station between the up and down platforms, but the up platform line was removed during a remodelling in 1997 and the platform widened in its place. Today it is the first stopping point for the ‘Enterprise’ after leaving Dublin, as well as having a regular commuter service. John MacBride, after whom the station was named on April 10, 1966, is noted for taking part in the Easter Rising purely by chance. He was born in Westport, County Mayo, on May 7, 1868, and by the age of 25 was considered to be a dangerous nationalist by the British; he fought against them as a major in the Irish Transvaal Brigade during the Second Boer War. After living for a time in Paris, he returned to Dublin in 1905 where, as a member of the IRB, he was active in preparing plans for a revolution. Yet he was kept outside the group planning the 1916 Rising due to him being well-known to the British, hence he was unaware that it was taking place that Easter when he found himself in Dublin for his brother’s wedding. On the morning of Easter Monday he witnessed Thomas MacDonagh leading his troops along Grafton Street, and quickly offered his services. He was appointed second-in-command of the troops that had taken the Jacob’s biscuit factory, surrendering on April 30. He faced the firing squad at Kilmainham Gaol on May 5. Great Western line from Dublin reached this north-west corner of Ireland. By 1881 the Sligo, Leitrim & Northern Counties Railway had opened its line to Collooney Junction, providing access to Sligo via Enniskillen, and in 1895 services from Sligo could access Limerick over the Waterford, Limerick & Western route from Claremorris. Since the W&L also met the main line at Collooney, from then until 1957 this village of some 200 people had three stations. These days only the old Midland line still serves Sligo, the line to Enniskillen closing in 1957, with passenger services to Limerick ending in 1963. The latter now forms part of the proposed ‘Western Rail Corridor’ redevelopment project. The station is a proper two-platform terminus station, which once boasted an overall roof (now cut back to form canopies). A passing loop is situated at the approach to the station, short of where the now redundant line to Sligo quay branched off; all goods service are dealt with there, leaving the main station purely for passengers. InterCity services from Connolly via Mullingar and Dromod arrive seven times a day, with the same number working in the opposite direction. Seán Mac Diarmada, after whom the station was named in 1966, was born on January 27, 1883 and spent much of his youth in nearby County Leitrim. He was a staunch believer in the Irish national identity, being a member of the Gaelic League, Sinn Féin and the Ancient Order of Hibernians. Like many of the Easter Rising leaders he was a member of the IRB, becoming very close to Tom Clarke, and was one of the original members of the Irish Volunteers. He even served time in prison for speaking out against joining the British army. With Clarke, Mac Diarmada was on the secret military committee responsible for planning the Rising, taking a lead role in many areas, and being one of the seven signatories of the Proclamation of the Republic. However, mobility issues caused by an earlier bout of polio, meant that his physical role in the events of Easter week was limited. He was stationed with Clarke in the GPO building, and he was arrested upon Patrick Pearse’s surrender. The Waterford & Central Ireland Railway (W&CI) opened its line from Kilkenny to Thomastown in March 1848, gradually working southwards to Waterford in stages. That same year the Irish South Eastern extended its line from Carlow to Bagenalstown, and two years later opened a line linking Bagenalstown to the W&CI at Lavistown Junction, thereby giving Kilkenny a through rail link to Dublin. Originally a terminus, the arrival of the Kilkenny Junction Railway from Maryborough (Portlaoise) in 1867 created a through station, which in its heyday boasted a double train shed, loco shed, turntable and goods store. This remained the situation until the line from Portlaoise was closed in 1962. The station was gradually run down until 1997 when a new station was opened immediately to the east of the old. Two platforms were extended and the old goods store refurbished to act as the station building. 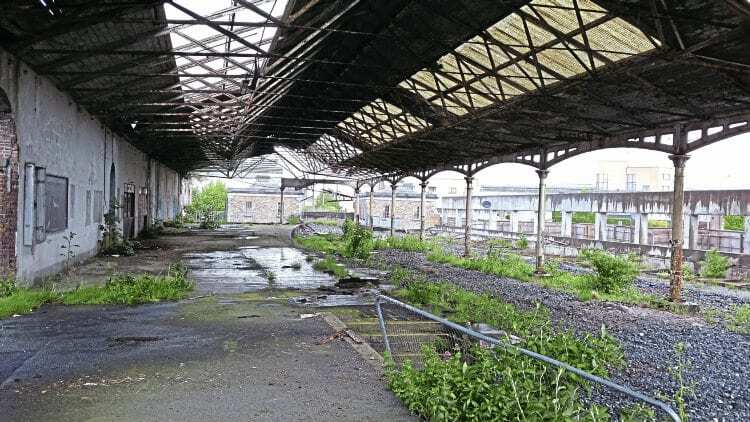 The original platforms and train sheds were taken out of use, although access to a run round loop was via a headshunt beneath the old roof. This was taken out of use in 2011, leaving the old station completely separate from the new one. Today, only one of the train sheds survives along with one platform. The name bestowed on Kilkenny station in 1966 was after Thomas MacDonagh, one of the signatories of the Proclamation of the Republic and the self-styled Commandant General of the Army of the Irish Republic. He was born on February 1, 1878 in County Tipperary and was lyrical from a young age, publishing poetry books and having a love of both English and Irish culture. Following his parents into teaching, he found employment at Patrick Pearse’s St Enda’s School, later becoming a lecturer in English at the National University in Dublin. Together with his friend Joseph Plunkett, MacDonagh joined the Irish Volunteers upon its inception, later becoming Commandant of Dublin’s 2nd Battalion, and became part of the IRB in 1915. Oddly, however, in spite of his being one of the seven ‘leaders’ of the Easter Rising, he only joined the military committee in the weeks before the planned rebellion. During the event itself, MacDonagh and his battalion were stationed at the Jacob’s factory, ultimately seeing very little in the way of fighting. His surrender came on April 30, and following his trial he was shot on May 12. Like most of the leaders he is buried in the grounds of Kilmainham Gaol. If Westland Row was the northern terminus of the Dublin & Kingstown Railway, its southern one was seven miles away at Kingstown – what we now know as Dún Laoghaire. The community had originally be known as Dunleary, but a visit by King George IV in 1821 resulted in the royal name being adopted until replaced by the current name in 1920. Dunleary had simply been the anglicised version of Dún Laoghaire. The present station was the second built to serve the port town, being completed in 1837 and about half a mile from the original. As the railway brought people out of Dublin, an atmospheric railway extension was built from Kingstown to Dalkey in 1844, but lasted only 10 years before being re-laid as a conventional railway. Given the town’s popularity, and growing ferry links to the UK, it is surprising that – even under DSER or GSR ownership – the station was only served by one platform. This remained the status quo, in spite of it being a considerable bottleneck, until a second platform was added in 1957. 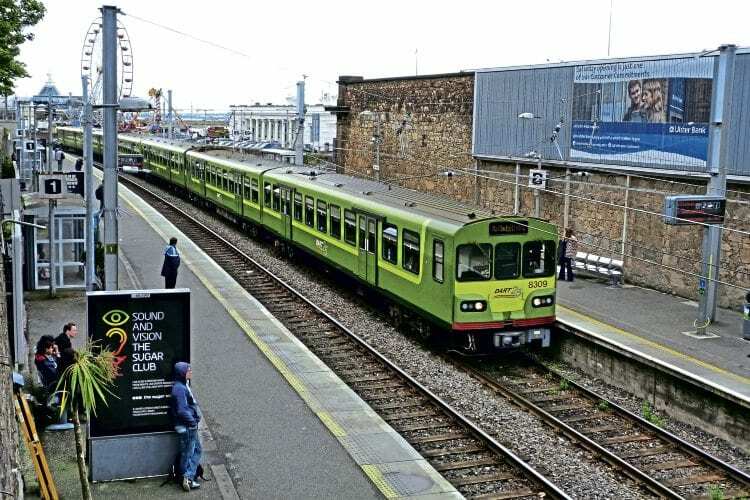 Today, Dún Laoghaire remains a busy station thanks to its rapid development as a commuter suburb of Dublin city; the platforms have been extended and more modern facilities added. The original Mulvaney-designed building survives, however, and was until a few years ago the home to Restaurant ná Mara – a high-quality eatery owned by the railway. Interestingly, the steps up to the booking hall from the down platform are a surviving remnant of the old atmospheric railway. The station is served by DART and commuter trains. 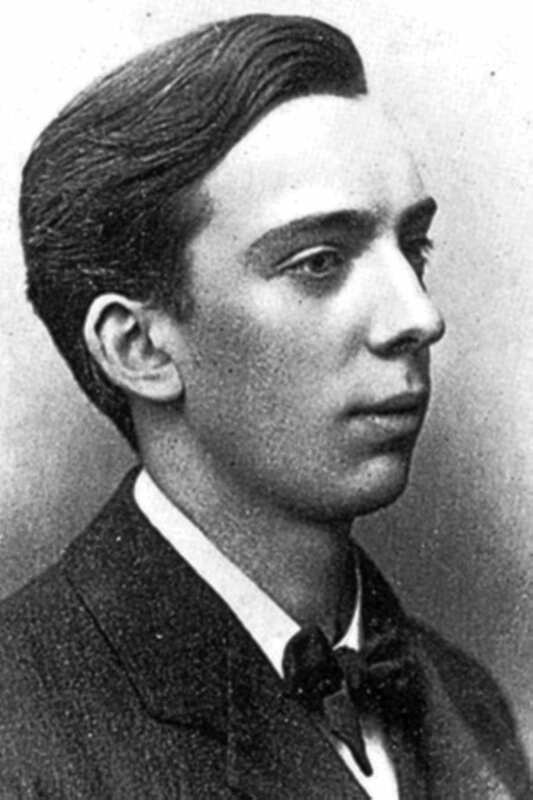 Michael Mallin was born in Dublin on December 1, 1874 and was a man very much in the mould of James Connolly. He held socialist values very highly and, after serving with the British Army in India and Afghanistan, became a founder member of the Irish Socialist Party. He was also second in command of the Irish Citizen Army, serving directly under Connolly. During the Rising he was with a garrison that occupied St Stephen’s Green and the College of Surgeons, surrendering on April 30. At his trial he claimed he thought that they were simply going out on manoeuvres that Easter Sunday, but was nevertheless convicted and sentenced to death by firing squad. He died on May 8. Wexford is probably best-known to the railway fraternity for its street-running section alongside the harbour; the sight of a Class 22000 railcar set passing through en route from Rosslare to Dublin or vice versa presents an incongruous sight. Yet surprisingly, in spite of being the county town, Wexford’s station is only a single platform affair. It was built following the arrival of the Dublin, Wicklow & Wexford Railway from Enniscorthy in 1872, opening in 1874 to replace an earlier station. For a short time from 1882 it became a through station when the Waterford & Wexford Railway made an end-on connection. This latter line soon closed, but was reopened by the – wait for it – Fishguard & Rosslare Railways & Harbours Co, a company jointly owned by the English Great Western Railway and the GSWR in Ireland. Wexford later became part of the DSER system, being its southern terminus and known as Wexford North (the FRRHC having its own station – Wexford South). 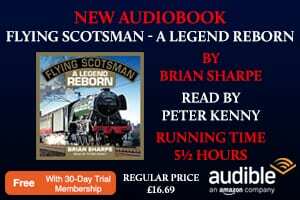 As built the station had extensive facilities on the down side, including a large goods shed, cattle bank, 50ft turntable, loco shed and sidings. With the exception of the goods shed, much of this has been swept away, although in more recent years the occasional permanent way train has been stabled there. With the coming of the mini-CTC signalling system in April 2008, a passing loop has been installed at the Dublin end of the station. A County Wexford native, Michael O’Hanrahan provided the inspiration for this station’s 1966 renaming. He was born in January 1877 in New Ross, but later his family moved to Carlow, where he joined the Gaelic League and set up a local branch in 1899. By trade O’Hanrahan worked as a proof reader for one of the league’s printers, but was also a journalist and a novelist. In 1903 he lobbied against a proposed visit by King Edward VII to Ireland, which led him to join Sinn Féin, the IRB and later the Irish Volunteers. He was subsequently made quartermaster general of Dublin’s 2nd Battalion, becoming close friends with Thomas MacDonagh. It was with MacDonagh that O’Hanrahan served during the Easter Rising, holding the Jacob’s factory until the surrender order was given. His rank within the 2nd Battalion, and his relationship with MacDonagh, most likely resulted in his death sentence at his trial. He was shot by firing squad at Kilmainham Gaol on May 4. Originally known as Waterford North until 1966, today’s station opened back in 1864 and was once at the centre of a fan of railways that came in from all compass points. The use of ‘North’ distinguished it from the other two termini south of the river, that of the GSWR line from Mallow at Bilberry, and the Waterford (Manor) terminus of the Waterford & Tramore Railway (W&TR). The first railway reached the town from the north with the coming of the Waterford & Central Ireland, swiftly followed by the stand-alone W&TR. The Waterford, Dungarvan & Lismore Railway was opened to rail users on August 12, 1878 running south-west, and from Waterford North the Waterford & Limerick headed west, the Dublin, Wicklow & Wexford ran northeast via New Ross, and Macmine Junction and the FRRHC to the east. 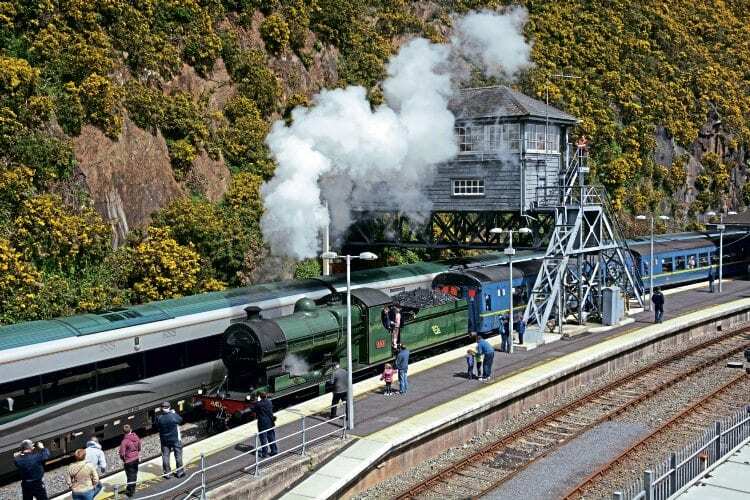 It was the arrival of the latter in 1906 that saw Waterford North become a through station, dominated by its elevated signal cabin that still straddles the railway. In spite of the loss of some of its serving lines as passenger carriers or through routes, Waterford remains a significant terminus, although its through status ended a few years ago with the withdrawal of services over the erstwhile FRRHC line to Rosslare. It is the terminus for InterCity services from Dublin Heuston and InterCity services from Limerick Junction. On Monday to Saturday there are seven trains daily in each direction between Waterford and Dublin, with four trains on Sundays. Its 1966 name is after Joseph Mary Plunkett, an affluent and well-travelled poet and journalist born on November 21, 1887. He was a talented scholar and student, passing his Trinity College exams in Dublin with distinction. Like many of his fellow Rising leaders, Plunkett was a member of the Gaelic League (through which he became close friends with Thomas MacDonagh), the Irish Volunteers and the IRB. Having gained some military training at college in Lancashire, in 1915 Plunkett was sent to Germany to assist Roger Casement in his negotiations for arms; those that were later sunk. Throughout his life Plunkett suffered with health problems, having contracted tuberculosis at a young age. Such was the case during Easter 1916, for in spite of having been one of the secret military committee that planned the Rising, days before the planned rebellion he found himself in hospital and undergoing surgery. However, he still managed to struggle to the GPO building on Sackville Street to help oversee matters, assisted by one Michael Collins – another figure that would go on to play an instrumental part in Irish history. Upon the surrender, Plunkett was held in Kilmainham Gaol where, seven hours before his scheduled execution on May 4, he was married in his cell to his sweetheart Grace Gifford. ■ Many thanks to Jonathan Beaumont for his assistance in preparing this article.